Madrid has a lot to offer during Easter. It's a great time to try out different activities with your family and delicious special dishes! Madrid attracts a lot of national tourism over the Easter break where families from all over Spain flock to the capital city whilst a vast majority of madrileños make the most of the short break to stretch their legs away from the bustling metropolis. For those who choose to visit with families or those who decide to stay whilst their neighbors seek alternative destinations, Madrid knows how to host a traditional Spanish Semana Santa with an inclusive, family appeal that invites admiration. In a city that is full of delights for children and adults alike, no visitor can escape the magic of Madrid. 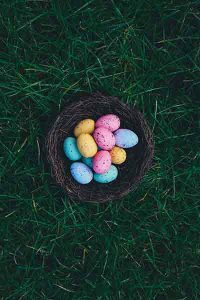 Gearing up for Easter 2019 the city’s tourism board has tried its best to translate the itinerary into English for a wider audience and is worth taking a look at for ideas. For first-time visitors our 100% guaranteed family fun suggestions include taking the kids on a walk starting in Puerta del Sol, through Plaza Mayor to seek out the infamous Spiderman lookalike, past the palace to the gorgeous Sabatini gardens with its resident parrots and down the Cuesta de San Vicente to see the palace from the stunning Campo del Moro gardens with its resident peacocks. 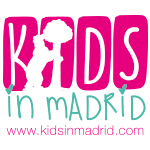 If your children still have enough energy, we recommend joining Madrid Rio and wandering along the meandering river under Madrid’s iconic bridges. They are peppered with play areas that offer fun activities such as toboggan slides, rope walkways, splash pads and zip wires. This unusual park is a favorite for older children as well as youngsters (there are plenty of swings and sandpits for toddlers too). Madrid lays on a few special treats for tourists in Semana Santa. First, on the list are the religious parades that draw tourists from all over Spain. The capital is home to some of the most important solemn and iconic Easter parades in the peninsula. Various brotherhoods from parishes across the capital join together to march along designated routes. They carry upon their shoulders some incredibly ornate and decorative floats that depict scenes from the Passion of Christ. The parades are often accompanied with marching bands which can be heard from a distance and which call spectators to their path… or warns those who need to get by before the procession arrives to get a move on! 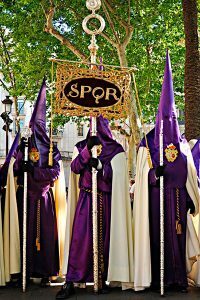 If you can only make it to one procession during your time in Madrid we suggest the 7 pm Procesión del Cristo de los Alabarderos from the Royal Palace on Good Friday as it is quite simply the most tourist-friendly of all the parades with room for youngsters and OAPs alike. If you can’t face the crowds at the parades but still want to get a feel for what they are about, you could always take your children to see the exhibition of Playmobil figures. This are set out in different scenes depicting the Passion. 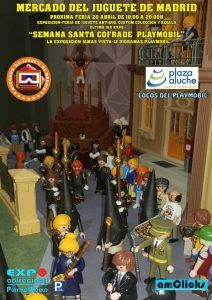 These are Playmobil figures like you’ve never seen before, dressed in archetypically Spanish outfits and in poses that faithfully represent Semana Santa. The exhibition is displayed in 12 glass cases placed at strategic points around the shopping centre Centro Comercial Plaza de Aluche (Avenida de los Poblados 58, Madrid). It takes place from 16th March to 21st April during mall hours, Mon-Sun. On Easter Sunday various drumming bands congregate in the Plaza Mayor from noon to have a dance-off to declare the best band of the Easter parades. This competition, known as La Tamborrada is loud, hectic and good-natured. A quieter and quite spectacular tourist attraction running over Easter is the Strawberry Train which leaves Principe Pio train station at 9:50h and takes visitors to nearby Aranjuez for a lovely day out visiting the gardens and Palace in style. Added extras include the children’s train and a punt down the river Tajo. Tourists are served strawberries and cream on the journey by actors in period dress. The return train brings tired and happy sight-seers back to Madrid at 19:30h. Whatever you do, don’t leave Madrid this Easter without… trying the local Danish pastry. Forget hot cross buns! Here in Madrid, the Easter sweet roll of choice is the unbelievably rich torrija. A take on bread-and-butter pudding. The bread is soaked in condensed milk and cinnamon before being powdered with sugar and fried to within an inch of its life. To say torrijas are delicious is an understatement!